Toronto, Ontario and Vancouver, British Columbia--(Newsfile Corp. - January 14, 2019) - Minera Alamos Inc. (TSXV: MAI) ("Minera" or the "Company") cordially invites you to visit with Company representatives at Booth #838 at the Vancouver Resource Investment Conference (VRIC) to be held at the Vancouver Convention Centre West (1055 Canada Place, Vancouver) on Sunday, January 20th - Monday, January 21st, 2019. Minera looks forward to updating shareholders and conference attendees alike on its aggressive plans for 2019, following the conclusion of a highly successful 2018 and especially given its progress on its proposed mine development, with permitting milestones achieved at the La Fortuna project, Durango, Mexico and pending permits at the Santana project, Sonora, Mexico. 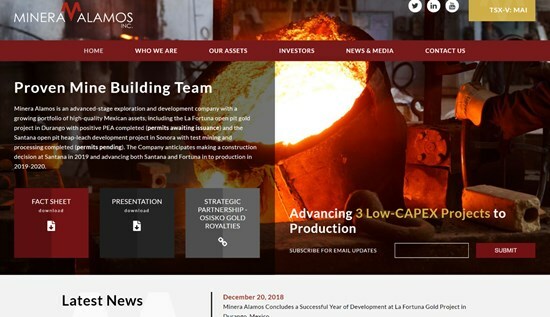 In addition, the Company is pleased to have launched a brand new and comprehensive website at www.mineraalamos.com and we welcome site visitors to sign up to ensure prompt receipt of Minera's news and updates. Minera Alamos is an advanced-stage exploration and development company with a growing portfolio of high-quality Mexican assets, including the La Fortuna open-pit gold project in Durango with positive PEA completed, the Santana open-pit heap-leach development project in Sonora with test mining and processing completed and the Guadalupe de Los Reyes open-pit gold-silver project in Sinaloa with mine planning in progress. The Company is awaiting the pending approval of permit applications related to the commercial production of gold at both the Santana and Fortuna projects. The Company's strategy is to develop low capex assets while expanding the project resources and pursue complementary strategic acquisitions.